Sallee was selected from a group of more than 20 of her peers at the high school. Those students nominated for May 2017 Student of the Month included: Thunyachanok Aphisumphoku (Jae), Jarod Bennett, Chase Cooke, Saundra Davis, Zakai Edgington, Kurt Ensman, Farrah Gregg, Thomas Haley, Breanna Harmon, Tyler Harris, Douglas Harvey, Alex Johnston, Dylan Jourdan, Megan Kostelnik, Katie McDonald, Jeran Pfeifer, Taylor Paone, Isaac Price, Sam Rigdon, Thomas Ross-Fox, Garrett Saunders, Dayton Scribner, Joah Singer, Anissa Smith-Sublett, Madelyn Thomas, Adam Zeger. 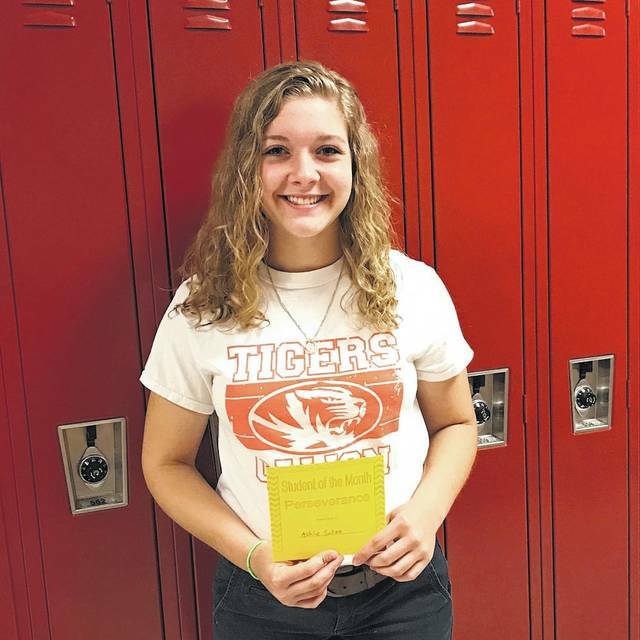 Sallee is a member of the Tigers’ cross country and track teams, and is also a member of National Honor Society, Teen Green, Student Council and Key Club. Ashlie plans to attend North Central State College, become an RN, start working and then further her education to earn her Bachelor of Science in Nursing.